This case does not come with the pick'n'pluck foam in the bottom or the convoluted foam in the lid, this is an empty case. This case comes with pick'n'pluck foam in the bottom and a convoluted piece of foam in the lid. This case comes with an adjustable padded divider set in the bottom and a piece of convoluted foam in the lid. This case comes with a TrekPak divider set in the bottom and a piece of convoluted foam in the lid. 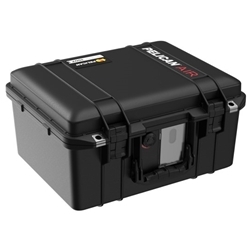 Pelican Air cases are up to 40% lighter than other similar polymer cases. The Pelican Air case lightens the load of a protective case while still giving the Guaranteed For Life protection that the Pelican name is known for. For decades Pelican has designed and offered the most influential protective cases to customers across the world and are now redefining the future of protection with this light and tough case option. Interior Dimensions15.15" x 11.38" x 8.52"
Exterior Dimensions16.87" x 14.10" x 9.27"
Shipping Dimensions18.00" x 16.00" x 11.00"